Hi friends! Wow! I feel like it's been forever since I updated you on all my local finds. I'm happy to be back at it. I mean, who doesn't love lunch dates w/ friends for blogging purposes? If you haven't even heard of The Kitchen, I'm telling you right now that this is an underrated lil' gem. It's nestled on beautiful main street and located right across from the Meaford Arts Hall. Next time you're cruising through, don't question it... take a peak in the window or even better yet, head on in and grab a bite. The Kitchen opened in 2009 by the very talented Christine Collins. She has been in the catering biz for over 40 years and has had a dedicated team behind her from day one making the small things come to life. If you've heard anything about her catering, you'll agree when I say it's delicious homemade cooking with a local touch. Small town living doesn't make it easy for 'keeping things on the down low' - nothing realllllllly stays a secret, for too long anyway. I had heard through the grape vine that employee Megan Robertson was going to be taking the reigns at some point this year - and this was no rumour. I'm super pumped for Meg to ignite her passion and continue making the Meaford cafe + catering scene wonderful. A combination of what you've learned from Christine and adding your own personal flare - you go girl! Today was a bit of a special visit as I was helping one my best friends, Chelcy, figure out catering options for her wedding. 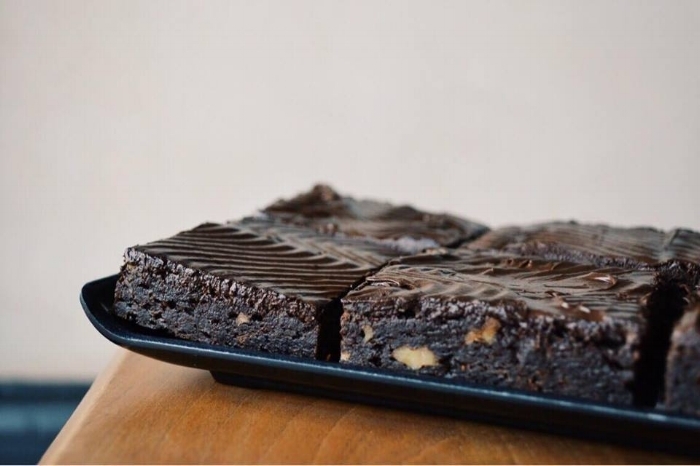 We had a really great chat with Meg, making some solid decisions but found ourselves staring down these espresso walnut brownies that were soon to be ours. Dessert first, anyone? Before we dug right into the brownie and slice of carrot cake (still dreaming about it), we ordered a few lunch items to share. All I have to say is FOCACCIA PIZZA. Unfortunately that's the only problem with sharing...you only get half. Let's just say I could have eaten a whole pan of this miracle za' - roasted garlic, cherry tomatoes, peppers, fresh basil + feta. Drool worthy, am I right. Another highlight had to be Christine's famous carrot cake. I'm talking legendary CC. I've never tasted something so moist in my entire life. It was the perfect marriage of those classic carrot cake spices to the thinest and most delicate layer of icing. This treat dates way back to when Christine was a girl and her mom would serve this recipe at family gatherings. It's made its mark and is a must-try at the Kitchen! Take note for my birthday, Mom. One thing that resonates with me is their genuine + conscious effort to keep things local in the kitchen. I mean why wouldn't you when you live in Grey County? The menu is ever-changing to match what's fresh in season and ingredients are sourced locally as much as possible. As a foodie, I love that. The feeling when I go to my favourite restaurants, not knowing what'll be on the menu that day is irreplaceable. On top of catering + lunch service, Meg hopes to expand the 'take-away' section of the Kitchen and offer a ton of nutritious frozen entrees, and hors d'oeuvres that are easy to grab and easy to whip up at home. Something we all need access to from time-to-time. All around, such a staple in the Meaford downtown core. If I haven't convinced you yet to head to the The Kitchen, you should. You really should. You'll enjoy a hearty meal that is prepared in house, and you'll sit amongst tables and decorations that'll feel like home. Can't wait to head on in for my next lunch date - who's down to go share-zies with me?